The Union Cabinet has expressed profound sorrow at the sad demise of former President of India, Dr. A.P.J. Abdul Kalam. In a resolution passed at a special Cabinet Meeting this morning, it said, “in his passing away the country has lost a visionary scientist, a true nationalist and a great son”. 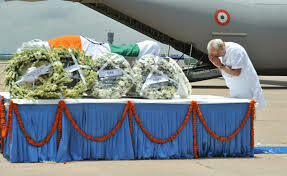 The Cabinet met under the Chairmanship of Prime Minister, Shri Narendra Modi and extended its heart-felt condolences to the bereaved family on behalf of the Government and the entire nation. The former President breathed his last at Bethany Hospital, Shillong, Meghalaya on 27th July, 2015. “Born on 15th October, 1931 at Rameswaram in Tamil Nadu, Dr. Avul Pakir Jainulabdeen Abdul Kalam, specialized in Aeronautical Engineering from Madras Institute of Technology. Dr. Kalam made significant contribution in developing India's first indigenous Satellite Launch Vehicle and made India an exclusive member of Space Club. Popularly known as the "Missile Man of India', Dr. Kalam was responsible for the development and operationalisation of AGNI and PRITHVI Missiles. He gave thrust to self-reliance in defence systems by introducing Light Combat Aircraft. Dr. Kalam was the Scientific Adviser to Defence Minister and Secretary, Department of Defence Research & Development during 1992-99. During this period, strategic missile systems were developed and the Pokhran-II nuclear tests were conducted. Dr. Kalam had served as the Principal Scientific Advisor to the Government of India, from 1999 to 2001 and was responsible for evolving policies, strategies and missions for many development applications and piloted India Millennium Mission 2020. In his literary pursuit, Dr. Kalam's books - "Wings of Fire", "India 2020 -A Vision for the New Millennium", "My journey" and "Ignited Minds -Unleashing the power within India" became household names in India and abroad. Dr. Kalam was passionate about transforming society through technology, in particular by inspiring the youth of India to harness science and technology for human welfare. Election Commission of India mourns the loss of former President of India, Dr. A.P.J. Abdul Kalam, who was an inspiring individual, a great scientist, a popular President and above all an indomitable spirit filled with new thoughts and energy. He has been a role model for millions of people in the country and abroad especially for his inspiring and mesmerising ability to channelize the untapped energy of the youth. Dr. Kalam was ECI’s first National Icon for voter awareness and participation in 2010 and since then has been championing the cause of greater participation for stronger democracy in the country. ECI is blessed to have him as inspirational mentor on several occasions including this year’s National Voters’Day function on 25th January, where he inspired us as the chief guest. 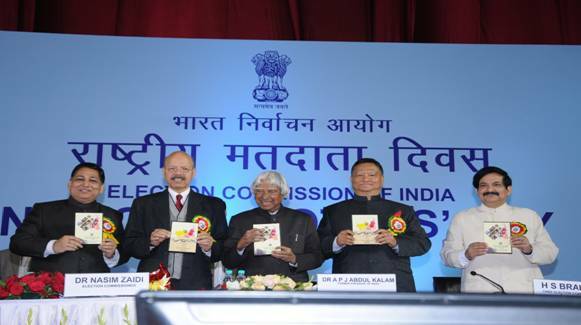 ECI fondly recalls his vision written by him in his book “A Manifesto for Change” where he envisions and advocates E-election scenario in which an election officer finds all details about a candidate on his computer system within few minutes thanks to e-Governance software and decides on his eligibility to kick start election process. Similarly, a voter by using a secured and authentic election mobile application vote by using his mobile and ID. He was always a guiding force for us and his death is an irreparable loss to the nation and hard to fill. Shri Ananth Kumar, Minister of Chemicals and Fertilizers has expressed his sorrow over the sudden demise of Dr. A.P.J. Abdul Kalam, former President of India. “With the passing away of Dr. A.P.J Abdul Kalam, India has lost a great visionary who ignited minds with his great intellect and also had the utmost compassion for and touched every Indian alike, young and old, rich and poor, haves and have-nots. He was the ideal President, Scientist and Thinker. He was very dear to every Indian’s heart, and it is a great personal loss for me as I had the honour and good fortune to spend many inspiring moments with him. Every interaction with him left me in awe of this extraordinary man. The Government has decided to release series of stamps on Singers, Writers, Freedom-fighters, Painters and Dancers. It has also decided that ceremonial stamps issued so far may also be made available in all post offices for easy purchase by the public. The philatelic advisory committee which met under the Chairmanship of Minister for Communication & IT, Shri Ravi Shankar Prasad yesterday also decided that stamps with picture postcards may be release on tourist places in India such as Taj Mahal, Ajanta and Ellora, Belur Math, Khajuraho etc. Shri Ravi Shankar Prasad also directed the department to conduct a letter writing competition at district level with suitable awards for the winner to promote philately among children’s. He also directed that a series of stamps on Charkha be released on 2nd October, 2015. Further, Minister of Communication & IT also suggested having designs of philatelic stamps through crowd sourcing. Commemorative postage stamp on “Swach Bharat”, the theme of Clean India was released by Department of Posts, on 30.01.2015, the design was decided through open competition. A commemorative postage stamp on Women Empowerment is being released on 15th August, 2015, the design has been decided by crowd sourcing. The MOC&IT also desired to bring technology in philately. Mobile app should be developed so that people can have information about philatelic stamps. Social Media should be used for promoting philately. Facebook on Philately has been introduced which has brought out awareness to the people throughout the globe. The Philatelic Advisory Committee (PAC) members comprising of eminent persons from various fields such as art, literature, music, dance participated in the meeting. In this context, it is to inform that the Philatelic Advisory Committee (PAC) members gave their valuable suggestions in the above mentioned fields and also discussed the steps to be taken for promoting Philately among the public of various age groups. Suggestions were made for promoting philately through Culture and Policies also. Joint Issues released by Department of Posts, promote Philately through Culture. The Union Minister for Science & Technology and Earth Sciences Dr. Harsh Vardhan hoped that substantial progress could be seen in the field of Science and Technology in next 365 days. Speaking at the foundation day of the Ministry of Earth Sciences in New Delhi last evening, he said, strategizing meetings were held with all institutions of the Council of Scientific and Industrial Research (CSIR) and also various institutions of the Department of Science & Technology, wherein heads of IITs also participated. Dr. Harsh Vardhan said further studies and experiments in the field of earth sciences are underway for a better prediction of climatic conditions. The Minister pointed out that various studies indicate that a financial benefit of about one lakh crore Rupees is accruing to farmers, fishermen and others, from predictions being made by various divisions of the Ministry of Earth Sciences. He said an estimate also shows that the benefit to fishermen alone amounts to about 50,000 crore Rupees. The Minister of State for Science & Technology and Earth Sciences Dr. Y. S. Chowdary has said that better efforts should be made to reach the weather forecast information in a more effective and timely manner to farmers, fishermen and other beneficiaries for such information to be fully beneficial to them. The Minister said efforts are being made to achieve these goals. In his Foundation Day Lecture Dr. V.K. Saraswat, Member, Niti Aayog said that proactive researches in various fields of Earth Sciences should be undertaken for a sustainable human development. The Secretary, Ministry of Earth Sciences, Shri Shailesh Nayak has said that substantial progress has already been made in the field of earth sciences research and the capabilities of the country are among the best in the world today. To mark the occasion national awards and certificates of merit were presented by the ministers to distinguished Scientists in the fields of Ocean Sciences, Atmospheric Sciences, Geoscience and Polar Sciences and Cryosphere. Prizes were also presented to winning children of a drawing competition held on the occasion of the Earth Day. The Government of India and the Asian Development Bank (ADB) today signed a $300 million loan to support the government’s flagship program, the National Urban Health Mission (NUHM) that is aimed at improving the health status of the country’s urban population. The loan – Supporting National Urban Health Mission – will reinforce ongoing government efforts under the NUHM to develop health systems in urban areas that can deliver quality health services and that reach the urban poor and vulnerable. It will focus on strengthening primary health care and also promote better coordination between health and urban sectors and opportunities for public-private partnerships. “The program’s due attention to achieving convergence across key sectors that affect urban health, and to actively involve urban local bodies in planning and delivery of urban health services, is commendable,” said Shri Raj Kumar, Joint Secretary, Department of Economic Affairs, Ministry of Finance, Government of India who signed the agreement on behalf of Government of India. “The use of ADB’s results-based lending modality will strengthen NUHM systems and overall results orientation, while allowing states the flexibility they need to pursue targets that they need locally,” said M. Teresa Kho, Country Director of ADB’s India Resident Mission, who signed the agreement on behalf of ADB. Shri N. B. Dhal, Joint Secretary (NUHM) at the Ministry of Health and Family Welfare, signed the project document on behalf of his ministry. The signatories to the loan also signed the accompanying capacity building technical assistance of $2 million, financed by the Japan Fund for Poverty Reduction. Significant capacity building and mechanisms for learning and innovation are also in-built to enhance NUHM systems, management capacity, and implementation processes. India is urbanizing rapidly, bringing a massive growth of urban poor. Disparities in health status between the poor and non-poor in urban areas are large, due to the adverse living conditions of the urban poor and their limited access to good basic health services. There are few preventive and primary health services in urban areas, while millions of people are faced with poverty every year due to high costs related to health care. The Appointments Committee of the Cabinet has approved the continuation of the assignment of additional charge of the post of Secretary, Department of Scientific & Industrial Research to Shri K.Vijay Raghavan, Secretary, Department of Biotechnology for a further period of three months beyond 31.7.2015 or until the appointment of a regular incumbent or until further orders, whichever is the earliest. Minister of Railways Shri Suresh Prabhakar Prabhu has expressed his heartfelt condolences over the sad demise of former President of India Shri A.P.J. Abdul Kalam. In a message, the Railway Minister has said “Dr. Kalam was a great scientist, super patriot and people’s President. All of us are proud of his superlative achievements. I was fortunate to work closely with him. In his death, we have lost a great son of India. He will ever be remembered for his contributions to the nation”. Minister of Youth Affairs and Sports, Shri Sarbananda Sonowal has welcomed the decision of Court of Arbitration for Sport (CAS), the apex court in sports regarding Indian athlete Dutee Chand. A three-member panel of the CAS chaired by Justice Annabelle Claire Bennett (Federal Court of Australia) suspended the International Association of Athletics Federations (IAAF) regulation governing eligibility of females with naturally-occurring Hyperandrogenism. Following the historic verdict given yesterday by the CAS, Dutee Chand is immediately and unconditionally eligible to compete after being barred from competing against women because her natural testosterone levels were too high. Until now, the regulation has caused female athletes with naturally-elevated testosterone levels to be suspended or to be banned outright from competition unless they undergo medical intervention to lower their testosterone levels. Dutee Chand challenged the regulations and the decision of the AFI to ban her in September 2014. She was given support from the Ministry of Youth Affairs and Sports, Government of India. Minister of Youth Affairs and Sports had assured the Parliament last year that the Ministry would provide all possible support to Dutee Chand. Following that, she was reinstated in the Centre for Excellence, Patiala and all supporting costs for her appeal and hearing in CAS was provided. Currently, she is training in Hyderabad. “This is a great day for women sports and for Indian sports. It is a tremendous victory for India”, said Shri Sonowal. The CAS has given the IAAF two years to present convincing scientific evidence establishing that naturally high testosterone levels provide an unfair athletic advantage to hyperandrogenic female athletes as compared to their peers. If the IAAF does not, or cannot, do so the Hyperandrogenism Regulation will be rendered null and void. According to the information provided by Dutee Chand, Toronto-based lawyer James Bunting, Justice Morris Fish of Davies Ward Phillips and Vineberg LLP, who represented Dutee Chand pro bono in CAS, her advisors include Dr. Payoshni Mitra, Professor Bruce Kidd and Dr. Katrina Karkazis in the case. Dutee Chand has expressed gratitude to Sports Minister Shri Sonowal and his ministry officials, SAI and all those who supported her unconditionally throughout.